Hated and feared by a mighty government, though the course of his life has almost run, aged Agapius Honcharenko, priest of the Greek church, and confessor to Count Leo Tolstoi, struggles with the last of an enormous vitality to accomplish his lifes work before he dies. For the emancipation of the Russian serf he gave up an imperial position, suffered the tortures of a Russian prison, and exiled himself from family and friends. He has successfully pitted himself against spy and assassin, who have sought for half a century to collect the five thousand rubles placed as a price on his head. Today, battling to accomplish that which he understood 50 and more years ago, this patriarchal deliverer of his people lives in a hidden nook of the mountains of Alameda county, California, apart from the world but still crying for freedom. Near by is his grave, dug in the shadow of a huge boulder by a famous Italian poet, waiting for him to lay down his battle flag. The future is as dear as the past has been and the closing days of an eventful life are fraught with a fear that death will overtake him before he can accomplish that which for half a century has been inspiration and endeavor. 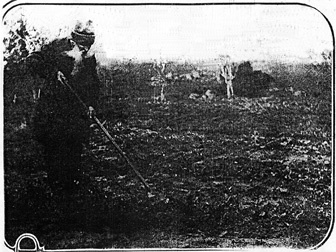 Once wealthy, the companion of Henry George, General Halleck, Horace Greeley, Secretary of State Seward and James Gordon Bennett  today penniless, ekeing out a meager existence from such garden track as his 80 years will permit, and withal spreading the propaganda of freedom among the downtrodden of his native country. The transition from power to poverty and its attendant trials is a story of self-sacrifice such as can be gleaned from the lives of only the greatest men who live, and strive for the fruition of a dominant purpose. On the crest of a lofty crag which drops sheer through pine and brush to a swift running mountain stream in the uttermost fastness of the coast range, Father Honcharenko is far from the strife of his enemies, yet in touch with the world into which as his scant funds occasionally allow, he sends copies of his little paper of liberty to Russia, where it is heralded as a deliverer and secretly read and circulated. The story of his life is the history of a great purpose and a magnificent achievement; a tale of laughter, love and tragedy. It is a record of moral heroism without thought or hope of plaudits or recompense; the chronicle of a good life well lived and impending death faced with stoicism and resignation. 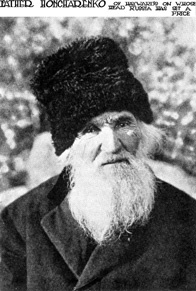 Father Honcharenko was born in Kiev, southern Russia, on August 19, 1832. Educated privately by his father, who was a Cossack land owner and slave holder, he studied for the priesthood and was ordained a deacon in the orthodox Greek church at the age of 27. Later he attained the rank of priest. His oratorical ability attracted to him the attention of the embassy, and his appointment as Russian minister to Athens as head of the Russian legation followed closely upon his ordination. From early childhood he had observed the oppression of the serfs and their liberation had become the dominating impulse of his life. In Athens he became interested in the Kolokol, a paper devoted to the abolition of slavery, published by Herzen in London, and from the day he affiliated with this publication his oppression and persecution, worse by far than that of the slaves whose cause he espoused, began a cycle which endures even today, when his strength of body can no longer respond to the dictates of his will. For months he contributed to Herzens paper, which was aiming for the emancipation of the sefs, and his correspondence, carried on in secret, aroused the government as well as the orthodox church which he assailed, demanding the abolition of serfdom and the division of monastic estates. Father Honcharenko was well qualified to write on his chosen topic and from his pen flowed scathing denunciations of the vice and greed which undermined the church. The government, after trying for months through the secret service to learn the identity of the writer whose expressions caused decided unrest among the lower classes and added fuel to the flame of peasantrys cause, detected him on February 16, 1860, through an agent of a London book seller, as he mailed a manuscript to Herzen. The Russian chancellor at the embassy was immediately notified and within a half hour Father Honcharenko was in chains in the hold of the man-of-war Strelok, running under full power to Constantinople. There he was thrown in a dungeon of the Russian prison and all Russia rank with the news of his arrest. The word spread to England and Herzen enlisted powerful influences to effect his release. While he was striving to attain his end a Polish Jew, peddling oranges in Constantinople, learned of his predicament and visited him with his peddling baskets. Through sympathy Father Honcharenko was smuggled an entire Turkish costume and in it he escaped. Not long ago, when speaking of his providential release, the aged man declared: "I will never forget that day I took off my priests robes, put on a Turkish costume, and passed put before the faces of the guardians of the prison, and escaped to London. Since then, by the Muscovite tyrants, I have been stabbed, shot, drugged, assaulted with brass knuckles, and even clubbed as a dog. I am yet alive, and, as a true Cossack, labor to free my people." In London Father Honcharenko was employed by the Kolokol, which reaped the fruits of his writing by seeing the serfs emancipated by the czar, and soon discontinued publication. In Athens, where he soon returned, the honor of Athenian citizenship was conferred on him and shortly after, pursued by the Russian government, which had set a price on his head, he returned to London. There he met Joseph Mazzini, the famous Italian patriot, who told him of the freedom of America across the ocean and gave him letters of introduction to Henry Citti, uncle of the woman he later married. Life in London became dangerous for Father Honcharenko and he slipped from London one evening and came to New York, proceeding to the home of Citti in Philadelphia. Through Citti his association with prominent Americans of his day commenced and he affiliated himself with the American Bible Society as collaborator and writer of its Arabic New Testament. The daylight hours were ones of fear, and at night he never left the home of his new found friend. Frequent attempts were made to assassinate him and several times he was wounded. Within a year from the day he arrived in Philadelphia Father Honcharenko was married t Albina Citti and he moved to New York. Here spies dogged his footsteps and the night hours were always spent in inside rooms of the house. James Gordon Bennett, the elder, admiring him even as have his enemies to the present day, published several articles from his pen and introduced him to Dr. Van Dyke, father of Henry Van Dyke, who was then a lad of 18. It was under Dr. Van Dyke that Father Honcharenko published the Russian bible, which sold for a shilling, or 25 cents, as against $2.50 charged by the Greek church. This competition in price earned him even greater disfavor and he awakened the slumbering hatred which had so persistently manifested itself in many ways. Eugene Schuyler, who translated Taurzenieffs "Fathers and Sons" and who was a nephew of General Schuyler of civil was fame, was one of his students, and through Schuyler he became intimately acquainted with Horace Greeley, Charles R. Dana, Hamilton Fish and General Halleck. Secretary of State Seward and Henry George were among his companions and their devotion and loyalty continued until their deaths. To Father Honcharenko belongs the distinction of establishing the first Russian newspaper in America, his "Cvoboda," issued for the first time in 1873 in San Francisco, where he had been forced to flee from the machinations of the Russians, who had made desperate efforts to get him aboard a vessel bound for St. Petersburg. He reached California in 1865 and founded the Alaskan Herald. He was naturalized five years later. In 1873 he became a charter member of the famous California academy of sciences and was among the most active of its members. With the publication of each issue of his "Cvoboda," or "Liberty" he sent 500 copies to Russia, where they were gratuitously distributed. One of his most telling blows at the despotism of the czar was the publication in Russian of the constitution of the United States. The distribution of this proclamation among the serfs infuriated the government and one winter night he was mysteriously assaulted and almost beaten to death before he was rescued. Another act charged as inflammatory was the organization of the Decembrists, a society of Russian sympathizers who sought to gain their ends by peaceful measures, such as the circulation of advanced literature, all of which was printed in the native language at his little printing shop. So desperate became the attacks of his enemies that he was forced to sell his paper and it was then he invested his meager savings in the 50 acre farm in Alameda county, across the bay. He chose a spot almost inaccessible on the ridge of a mountain and moved his fonts of Russian type to a little room he built for the purpose, where he set up different articles advocating freedom and sent them to the land whose rulers hated him as its worst enemy. The farm is fertile today, but Father Honcharenko can not till the soil as he did some years ago. His few cows and garden produce brought in sufficient funds to insure the occasional publication of his paper, but of late there has been scarce enough revenue to buy bread for his table. The very atmosphere of the place is one of patriotism. On the gate is the single word "Ukrania," carrying its message of freedom and peace, and beneath the gables of the house itself is the lone word "Cvoboda," the key note of his life, the battle cry of his heart. "Revenge on the Wolves that devour the Lambs." Yet there is nothing vengeful in the heart of the man who wrote the sentence. His meaning is figurative and it pains him to have it misunderstood. He has been accused of being the most dangerous alienist of all Russia, but the revolution he advocated is educational, and violence is foreign to even his inner thoughts. The little guest book, presented him by an admiring friend years ago, contains the name of Vasili Vereschagin, the famous Italian poet and patriot, who once spent several days with him. During the visit he hollowed from a bed of rock a deep grave which Father Honcharenko declares shall be his upon his death. Vereschagin meant it for him  and he will respond to wishes of his friend when he passes out of the world that has been his pupil and his tutor through many years. The death of Vereschagin, who was blown up by a Japanese mine at Port Arthur, deeply touched him and the death of his famous friends occurring one by one, is leaving him alone and forsaken by all but the little woman who has been his wife for almost half a century and who is content to accept the bread her master breaks. There us no money to smooth the way of Father Honcharenko and poverty stalks the pathway of his declining years like a specter that cannot be throttled. To those who visit him he will turn the tea from the samover and set coarse bread upon his table with the grace of an affluent host, with the courtesy of a gentleman and the generosity of a man of wealth. "If I had more, my dear friend," he will say in pitiful anticipation of his guests thought, "I would be happy to set it before you. I give you what I eat. I cannot apologize. Some say I am old and poor. Ah, my friend, they are mistaken. I am neither old nor am I poor  I am happy." Father Honcharenkos happiness is the benediction of an easy conscience that the strife of the world in which he lives has not hardened and that through the years of his unswerving fight for his countrymen has not been sullied by even the stain of violent thought. He will take you into the tiny parlor with its portrait of Herzen on one wall close beside a framed print of an assassination scene in Russia. You will hear him softly explain the fundamental principles of his doctrine, and you will read his little library of scrapbooks. He will speak of the late Count Leo Tolstoi, whom he first knew in 1853, and later confessed in Alexandria, Egypt; he will dwell on the succeeding chapters of his life and tell his whole story simply, as great men do. And you will go from him with the conviction that Russia needs him to mold its future and that instead of having a price upon his head he should be accorded the honors his sincerity and efforts have earned him. Father Honcharenko is like scores of men long dead whose worth was not revealed to the world until after death, when it was too late to render the tribute due them in the flesh. The Agapius Honcharenko of Athens and the name of California today are difficult to recognize. The man of foreign lands was stalwart and virile; and the man of the present is a pitiful shell, stoop-shouldered; dependable on his cane that aids him into his little garden when the sun if shining and assist him back to the house when the chill of late afternoon settles over the mountain top. But in the man of yesterday and the man of today there is the courage of the lion and the zeal of the priest. "The spirit of willing but the flesh is weak." The San Francisco Call, Sunday, April 9, 1911.